A quarter century ago, the Los Angeles-Orange County area seemed on the verge of joining the first tier of global cities. As late as 2009, the veteran journalist James Flanigan could pen a quasiserious book, “Smile Southern California: You're the Center of the Universe,” which maintained that L.A.'s port, diversity and creativity made it the natural center of the 21st century. A very different impression comes from a newer report, The Los Angeles 2020 Commission, which points out that, in reality, the region “is barely treading water while the rest of the world is moving forward.” The report, which focuses on the city of Los Angeles, points to many of the problems – growing poverty, a shrinking middle class, an unbalanced city budget, an underachieving economic and educational system – that have been building for decades. Sadly, “the 2020” report more accurately reflects L.A.'s current situation than Flanigan's more optimistic view. All the more remarkable – and, perhaps, ironic – is that the signatures on the report come from many of the same political figures, union leaders and political advocates who have done so much to create this very sad situation. Disappointingly, the L.A. City Council already has started making its excuses, while the report's authors, as the Daily News' Rick Orlov notes, have already started “softening” their sometimes-harsh assessment. It is difficult, for example, to take seriously a report that, on the one hand, worries over pension costs but is signed, and supported, by the likes of County Labor Federation boss Maria Elena Durazo and L.A. Department of Water and Power union head Brian D'Arcy. For the most part, the commission was made up of lawyers and others who feed off the very pattern of insider deals and misdirected investment strategies that have so humbled a great city, and region. No surprise, then, that their biggest concrete recommendations were to speed up the pouring of concrete for their various pet projects, some of which make sense, while other don't. Nevertheless, the report suggests that, perhaps, at last, even the most comfortably entrenched leaders are finally waking up to the predicament they and their colleagues have helped create. What they need now is a strategy that restores to Los Angeles the global status that is a prerequisite for progress. Why does being a global city matter so much? In large part, it is the best way to compete in a globalizing economy where the successful cities are defined not by size or population, but by the unique services they offer the world. In an ongoing study I am directing for the Chapman University Center for Demographics and Policy, with the assistance of the Singapore Civil Service College, we identified the leading world cities. We focused on such things as financial services, industrial specialization, media and culture. In the business of global cities, many of the biggest urban areas – in fact, all the largest ones, excluding Tokyo – failed to make the top 30. Instead, New York and London did best, along with such Asian cities as Tokyo, Hong Kong and Singapore. Perhaps our most surprising finding was that California's two great metropolitan areas, the San Francisco Bay Area and Los Angeles, ranked sixth and seventh, respectively. Why, despite all its problems, is Southern California ranked so high? This is largely a reflection of several factors – notably, a still-sizeable tech sector, a huge port and strong cultural diversity – but, most importantly, because of Hollywood. Great global cities, by our calculations, are often what can be seen as “necessary cities.” They dominate economic niches to an extent that someone from outside the region is compelled to do business there. This is true, for example, for finance and media in New York and London, while the Bay Area dominates tech. Similarly, Hollywood is nearly synonymous with the American entertainment industry, which is by far the largest in terms of revenue and influence in the world. Last year, the industry enjoyed a trade surplus of roughly $12 billion; film and television industry exports totaled nearly $15 billion. 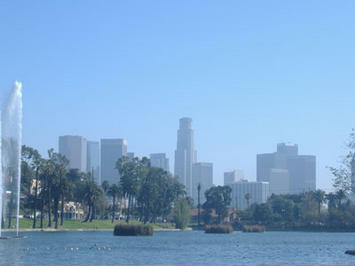 Every major global movie studio in the world is located in Los Angeles, which is also a key hub of the music industry. So dominant is Los Angeles' entertainment industry that many countries, trying to preserve their own cultural industries, have placed strict quotas on the number of English-language films that can be shown and songs that can be played on the radio. Los Angeles-Orange County once also enjoyed a dominant position in aerospace, but this industry has dramatically faltered, as the sector shrank by some 240,000 jobs as companies moved elsewhere, taking with them much of the region's technical talent. The port of Los Angeles, another economic linchpin, remains somewhat dominant but the trade sector faces growing competition and suffers from the kind of institutional malaise that affects so much of business here. The region retains a foothold in the auto sector as the U.S. base for some Asian makers. Even here, however, there are clouds, as Nissan relocated to Nashville, Tenn., and Honda moved top executives to Ohio in order to be nearer to its manufacturing. More promising, the new Hyundai U.S. headquarters in Fountain Valley signals that global carmakers still see L.A.-Orange County as a “necessary” place. The region has held on to a leading, if somewhat smaller, share of entertainment, but L.A.'s other traditional industrial strengths, such as aerospace and defense, have badly eroded. One bright spot is technology. Somewhat surprisingly, the Startup Genome project ranked Los Angeles as having the second-strongest startup ecosystem in the United States. Yet, overall, L.A. has been losing ground in terms of employment, technology employment and net migration to other ascendant regions. Perhaps the most critical factor affecting L.A.'s global status revolves around technology. It was shocking to me, at least, with L.A.'s focus on global ties, that the Bay Area has now slightly nosed out Southern California in our study's rankings, largely due to that region's technological preeminence. The region hosts the largest concentration of cutting-edge tech firms in the world. This fact alone allows the Bay Area to play a profound role in how globalization works, notes analyst Aaron Renn (www.urbanophile.com), particularly since innovations coming from that region arguably are a more primal enabler than advanced producer services. Indeed, according to one study, three Bay Area counties – San Francisco, San Mateo and Santa Clara – rank as the top three for concentration of tech jobs, and are among the leaders in growth. More serious still, Silicon Valley's technological push is threatening to upend the structure of Hollywood and media. Over the past decade, Internet and software publishing, which are heavily centered in the Bay Area, have added close to 100,000 new jobs, while traditional media – based largely in New York and Los Angeles – have lost almost three times as many jobs. Google and Yahoo already are ranked among the largest media companies in the world. (Yahoo refers to itself as a digital media, rather than a technology, company.) Apple now has a great deal of control over consumer distribution of entertainment products like music and video. The entrance of Netflix, and other tech firms, into the television production business could further undermine L.A.'s entertainment dominance. To the new-tech oligarchs, older industries are prisoners to what one venture capitalist derisively called “the paper economy,” soon to be swept aside by the rising digital aristocracy. These issues, and challenges, are what the 2020 Commission people should be addressing in their search for solutions to the L.A. region's relative decline. As our research indicates, Los Angeles-Orange County remains a major world city, but its upward trajectory is threatened by changes in technology and the rise of other regions in the U.S. and abroad. Now that members of the L.A. establishment have acknowledged “the truth,” perhaps it's time for them to come up with ideas that can make the truth more pleasant.